On this very special episode of IPC Zac and Ben devote some time to discuss some important issues currently facing all fandoms, specifically the rise in incidents involving "toxic fans". 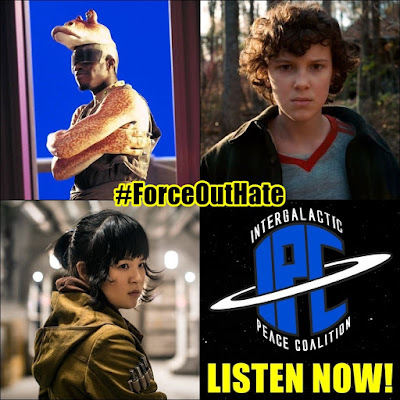 The guys are joined by Clarice Taylor from The Holofeed and good friend & patron Katie Horn to get their take on the turmoil while putting the "Peace" back in the Intergalactic Peace Coalition. They address the recent news regarding Kelly Marie Tran deleting her Instagram due to bullying, Ahmed Best opening up about his struggle with suicidal thoughts, and Mille Bobbie Brown leaving Twitter after an offensive meme of her circulated. The four of them share heartfelt thoughts about the situations and how to properly deal with it all. But don't worry, this episode isn't all serious. Stay tuned for lots of good banter, a couple of inspirational Quotes of the Night, and a very Vegan #BBQWatch. Listen for all that and more!